Isner vs Mahut finally ends at 70-68 // Game over, Isner wins 70-68, and a lot of potatoes. Some physiological estimates of workload. It’s been over 24 hours since the longest game in history finally ended. At one point, it seemed that we might still be playing into the second week of Wimbledon, but eventually, in the 138th match of an epic set, Mahut finally conceded a game on serve, and John Isner of the USA emerged victorious, in the longest match in tennis history. The final set was in fact almost two hours longer than the previous longest match ever played. It would come as no surprise to you to learn that John Isner paid for his 183 game marathon, and lost 6-0, 6-3, 6-2 to Thiemo de Bakker in the second round. Yesterday I did a post describing some of the demands of playing a match this long. This was picked up by the Washington Post, and they contacted me last night for some comments and ideas of the physiological demand. But rather than repost all those thoughts, below is the graphic they drew based on my eventual assumptions, which you can see in its original format here. One of the things I realized after is that one of the most amazing things about the match is the energy expenditure involved. A tennis player would expect to burn between 11 and 15kCal per minute. So, if we go for the middle ground, we assume 13 kCal per minute. In a match where serving was do dominant, this could well be a slight over-estimate, but it’ll do for assumption and illustration’s sake. Therefore, in 11 hours and 5 minutes, the energy burned would be around 8500 kCal. How much is this? Well, if someone like Isner, who weighs 110kg, were to run a marathon, he would burn approximately 4600 kCal. 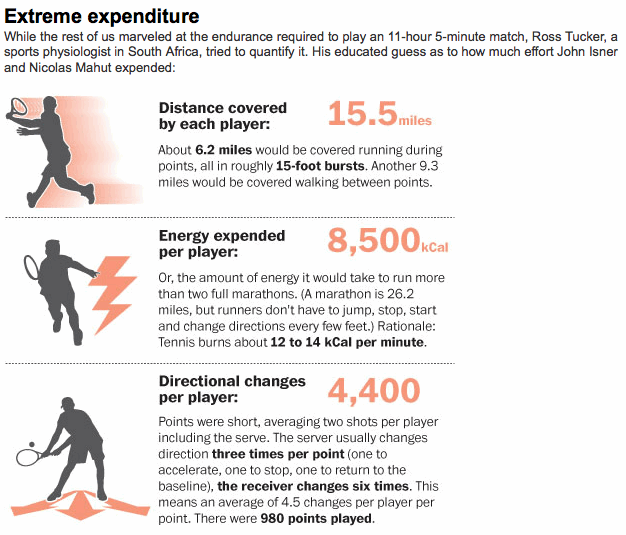 So, his 11 hour tennis match came at the cost of almost two marathons. Sure, it was “run” over 3 days in installments, but the numbers are extra-ordinary. To give you an idea of just how amazing, three medium sized potatoes provide about 200 kCal, and so the Isner-Mahut match “cost” about 129 potatoes per player. Or, if they prefer Coca-Cola as a source of fuel, then you’re looking at 20 liters (about 5.3 gallons) of Coke to replace the energy. This is conceptual, of course, it’s intended to highlight just how much work is done playing tennis at that level for that long! It also shows just how important nutrition would have been to recovery, both during change of ends and after the day’s play. Like Tour de France cyclists must eat to survive, Isner and Mahut would have had to get a lot of food down to replace their glycogen reserves! As for dehydration – I’ve seen a few reports saying how “dangerous” this would be – it’s not. As long as players are able to drink to thirst, they’re fine. And with change of ends every five minutes, Isner and Mahut would have had plenty of chance to drink enough to stay perfectly hydrated. The bigger problems were energy intake, and then muscle fatigue. One final point – the biggest demand in the match is the mechanical loading of the muscles. This is because of the nature of the game. About 4,500 changes of direction, 500 jumps and 2000 short, sharp accelerations and decelerations put significant load on muscles, and in particular, they require eccentric contractions. These contractions cause muscle damage – microscopic tears in muscle fibres. This is why players lose their speed and power after about 20-20 in the fifth, and this is why they look so sluggish playing. For Isner, this would have been a big factor affecting him playing against de Bakker today – the worst muscle soreness comes about 48 to 72 hours after the exercise bout. So today would be perhaps the worst day! So Isner, not surprisingly, saw his Wimbledon campaign end in three very short sets against de Bakker. He played the equivalent of five matches just to reach the second round, but had little chance of progressing. However, his status in history, along with that of Nicolas Mahut, will remain forever.